This year's fall coho salmon fishing will open in the tidal portion of the Fraser River on September 29th (see fishery notice). This fishery can be participated by anyone, young or old, who has a valid BC tidal water fishing licence and salmon stamp. The fishing can be done from shore, at various spots along the Fraser River between Steveston and Mission. The goal of this article is to provide enough information for you to get started. Coho salmon can be targeted by a variety of fishing techniques in the Tidal Fraser River, including bar fishing with roe and other bait, spincasting spoons and spinners, and fly fishing. This versatility, and availability of shore access, makes this fishery suitable for both novice and experienced anglers. 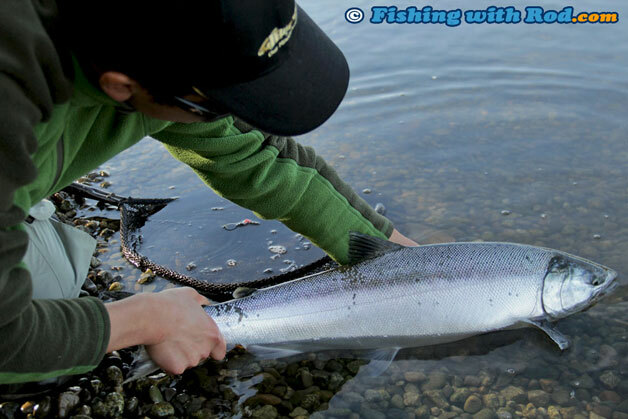 While fishing for coho salmon in October and November in the Tidal Fraser River, you are also very likely to encounter other species including chinook salmon, chum salmon, bull trout and cutthroat trout. It is important to learn how to identify each species correctly. When a species is caught and cannot be identified, please release it with care. You should note that all wild coho salmon have to be released, only hatchery marked coho salmon (ones without an adipose fin) can be retained. It is important to know what species you are allowed to retain by revising the BC Tidal Waters Sportfishing Guide. Below is a list of articles related to this fishery which we have compiled for you. Below is a list of videos related to this fishery which we have compiled for you. Ongoing updates of this fishery will be available on this page.